I've been working on an Opening Day collection - the project is kind of random but it's fun accounting for the random cards to be added for a particular year. I've listed the cards I have and cards I need in a Google Sheets file and I'm trying to see how many cards I can pull from my collection - much like with my Angels frankenset project, maybe a goal is really to use up much of my base and ‘lesser’ insert cards that I've picked up. 1.) I want to include only the starting nine players in the game on the field and DH - a couple of possible wrinkles would be at least include the manager, coaching staff as well as the others players that got into the game, but maybe the loose card project gets too complicated to get going otherwise. 2.) I want to use team / era appropriate cards - any random year card picturing a player with the team works though I’d like any particular card to be as close to the opening day year as possible [not counting retro cards]. 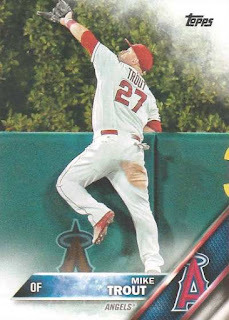 There might be cases where using a card picturing a player on a different team will have to do - I'm not going to lose sleep over seeking out actual Angels cards for random common, junk wax era players if I have other cards I could use; in some cases players who have made an opening day lineup may not have an Angel card made for them. 3.) Using doubles to represent a single player in different years is fine - though I want variety, I want to use different brands of cards if possible. 4.) Organization and storage - I’ll probably collect these cards in a box with the goal of storing them in plastic pages; within the actual, physical collection, I want some sort of notation as to what the cards to represent; maybe a printed out ‘header sheet’ [like this one] will suffice with a summary of what the collection consists of. 5.) Baseball-Reference.com - has all the opening day information and will be used as my main resource for this project.